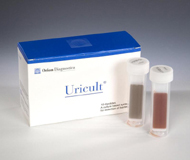 The Uricult® UDP was designed for UTI screening by providing a semi-quantitative colony count along with a presumptive identification of many common uropathogens. The product consists of a two sided paddle containing selective and non-selective media that fits securely into a screw cap plastic vial to maintain sterility. One side contains C.L.E.D. agar that changes color in the presence of various organisms including E. coli, Proteus, Pseudomonas, Enterobacter, and others. The opposite side contains EMB (Eosin Methylene Blue) agar, a selective medium that will support the growth of most Gram negative organisms while providing additional information regarding the suspected pathogen. To test a sample, the Uricult® dip paddle is removed from it’s protective vial, immersed into the urine sample, and returned to the vial for incubation at 37º C for 18-24 hours. Smaller samples can be dispensed directly onto the media using a syringe or sterile pipette. For an even more accurate colony count, specimens can be streaked onto the paddle with a 10ul calibrated loop. Following incubation, the results are compared to a color chart See an example. for presumptive identification and colony count. The entire vial can then be sent off for confirmation and antibiotic susceptibility testing. Click here for complete testing instructions. Get up and running with our Uricult Start Up Package featuring the customized Cultura-M incubator. We'll even help you pay for it! Click here to find out how. Uricult UTI Culture Paddles are sold 10 to a box with typical dating of 3-6 months. Note: As with all culture procedures, a 37° incubator is required. Call (800)330-1522 for our complete listing of both new and refurbished units or Click here for great buys! .